First the reminder . . . SUNDAY is the deadline for making Tic-Tac-Toe blocks if you want to receive the February Sneak Peek email message. Note to self: I need to get busy with a couple more sample blocks and the guidelines. Although it has no practical use, except maybe as a too-long too-skinny table runner, I decided I wanted to quilt the Block Lotto banner. Here’s a detail photo. Check my blog, sophie junction, for a longer view . . . and to tell me about your favorite part of quilt making. I decide to use a 4″ border quilting template from my collection . . . even though the only border on the banner that’s 4″ is the bottom. So I edited as I marked on the top and added some of the design elements in between (and inside) the letters. 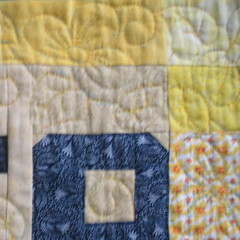 I’ve decided it needs a blue plaid border cut on the bias . . . now, to see if I have anything that will work in my stash. You still have almost two weeks before the end of the month and the drawing, so don't panic. Ooo, can't wait to see what's in store for February!